Taika Waititi’s Hunt for the Wilderpeople achieves a pitch-perfect balance of silly humor and compassionate characters, proving both oddly funny and profoundly moving despite some very clichéd archetypes propelling the story. 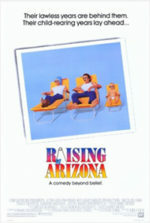 Part coming-of-age tale, part buddy movie, part road movie, part on-the-run adventure, part comedy about a crotchety old man and a young boy becoming friends, the film occupies several tried and true formulas. And yet, because of Waititi’s distinctive treatment and altogether unique voice, it feels wholly original in the way similar films by Wes Anderson (Rushmore) or David O. Russell (Silver Linings Playbook) often do. Not until after it’s over do you realize how Waititi avoided every pitfall inherent to the various genres he’s playing with, and finally come to appreciate Hunt for the Wilderpeople as something exceptional. Much of the coverage about this film has been through the lens of Waititi’s next project, Marvel’s Thor: Ragnarok, as critics have made consistent remarks about Hunt for the Wilderpeople, suggesting it’s merely a precursory effort on the writer-director’s part—probably because it received a limited theatrical release after Marvel made their announcement about hiring the New Zealand filmmaker. But, along with his 2015 vampire mockumentary What We Do In the Shadows, this film stands on its own, without need to justify Waititi’s career by way of his impending blockbuster. To be sure, Hunt for the Wilderpeople demonstrates Waititi’s control of style, his balance of laughs and emotion, his ability to shoot an exciting action sequence, and how far he can extend his budget. Shot for a mere $2.5 million, the film appears as if it cost much more, perhaps because local scenery makes the film look gorgeous and expansive, while the occasional CGI is completed by New Zealand’s resident special FX house, Weta Workshop. Ricky himself is another matter. He wants to be gangsta, dons bling-printed hoodies, and claims his best friend is Tupac. (After Bella gets him a dog, who Ricky names Tupac, the boy’s claims are true.) He seems peculiar and self-styled; and yet, after more than a decade of foster homes, he’s in desperate need of love. Consider the way he takes to “Auntie” Bella after receiving something so simple as a hot water bottle. Elsewhere, Bella’s gruff husband, the scraggly woodsman Hector or “Hec” (Sam Neill), isn’t interested in Ricky. “Autie says I should ask if you need any help,” Ricky asks him. “You can help by leaving me alone,” Hec replies. But when Bella dies suddenly, leaving the two headstrong males alone without a motherly figure or wife-caretaker, Ricky makes for the wilderness to avoid going to juvenile prison. Worse, a misunderstanding leads the media to believe Hec has kidnapped Ricky and a manhunt ensues, headed by Paula, proclaiming her impassioned motto “No Child Left Behind”. What follows are several months in the bush, with sections of the story divided into chapters such as “Broken Foot Camp” and later “War”—giving the film a comically mythical atmosphere. Hec must teach Ricky to rely on his “knack” to survive the wilds, even though the boy never loses his baseball jacket and vinyl cap. They encounter various animals and people on their adventure, and, of course, they bond through the experience. But this says nothing of Waititi’s humor, experienced largely between the interactions of his two male leads. Ricky’s overactive imagination finds him dancing to homemade leaf-and-twig headphones or calling out a situation’s similarities to The Lord of the Rings at an inappropriate moment. He’s every bit as unapologetic and singular as the children from Anderson’s Moonrise Kingdom (2013), and even more idiosyncratic. Asides with bush-living characters like Psycho Sam (Rhys Darby) or a sausage-eating family are downright hilarious as well. Waititi also explores innovative technical tricks. 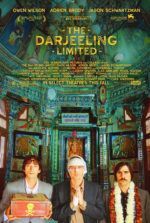 Rather than a standard traveling montage wherein cutting together individual scenes denotes the passage of time, the director rotates his frame 360 degrees in a shot digitally rendered to appear visually unbroken. Within the rotation, we see multiple versions of the same characters searching and discovering, walking in and out frame, or simply making headway on their journey. Throughout these creative transitions, Waititi manages to make us laugh, bond us to his characters, and impress us with his formal presentation at the same time. 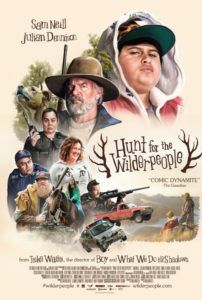 Most astoundingly, before the proceedings give way to a rousing car chase involving the military and some vehicular acrobatics, Hunt for the Wilderpeople thoroughly convinces us that Ricky and Hec would be better suited as two friends wandering the bush together forevermore. An endearing thought, to be sure. Although one cannot help but look forward to Waititi’s forthcoming big-budget project for Marvel, there’s a greater part of this critic that mourns how the director isn’t going to keep doing what he does so well: smaller personal films like this one. Hunt for the Wilderpeople is essential viewing for today’s blockbuster-obsessed audiences, as it will remind them that adventure and humor aren’t exclusive to comic book adaptations or mega-budget tentpoles. Indeed, Waititi has made a wonderful kind of crowd-pleaser, while Dennison and Neill make an unlikely, but endearing pair. 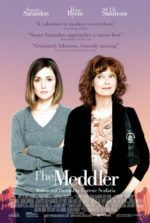 His film captures a range of unexpected emotions in a package that could have easily been a forgettable trifle or just another all-too-familiar indie comedy. Instead, he delivers unconventional humor and tearjerking sentiment, reminding us that familiar stories can still feel fresh when told from a new perspective.